Who actually prefers seeds in his watermelon? Watermelon grows here locally and plentifully. It's available most of the year and I eat more than my share of it. Increasingly though, all I've been finding are the boring seedless ones. I'll go out on a limb here and admit that I eat watermelon seeds. They add a shot of texture to watermelon that makes it watermelon in my mind. Beyond that, watermelon seeds actually taste good. So is this a me and me alone thing? Paul, you aren't the only one that prefers seeded watermelons. I won't buy anything else, although seeded watermelons are nearly extinct in stores these days. I don't eat the seeds, but the 'real' watermelons are the only ones with any flavor. Those little seedless ones, in addition to being biologically-or-genetically-modified eunuchs, are mealy and flavorless. As you can tell, I get a little worked up about my produce! Nothing better than finding a sweet orange-meated watermelon when its hotter than hot outside! Try eating the seeds some time. They're good! And they give watermelon a nutritional boost it lacks otherwise. Thanks for weighing in here gang. It's good to know I'm not the only one. It's good to be surrounded by purists! You bet you can eat them. Try it some time! But if you eat the seeds a watermelon will grow in your tummy! Seeds please! Not for chewing but for spewing, baby. Plus, I don't want variagated green hair from ingesting them. What? Green hair? There's one I've never heard before! 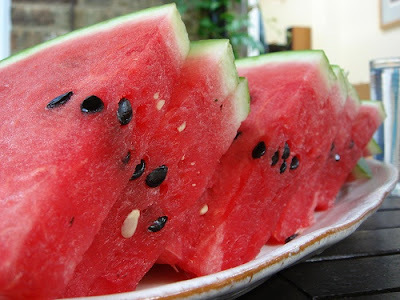 I like eating the seeded watermelon, but I save the seeds to feed to my urban chickens! I grew up spitting watermelon seeds with my brothers (who could spit one the farthest?). But I've only swallowed them accidentally. How about frying or baking them? Has anyone tried? One of my Fall favorites is cooking up Pumpkin seeds, browned with plenty of salt. Mom always said if you swallow them they will sprout in your stomach. I guess it never occured to her that you should chew them first! I'll have to give it a try if I ever see them sold around here with seeds in them. I love watermellon and often get the little "icebox" size which is just enough to feed desert for my family of four. So far, Laurie Burke and I are the only ones who'll admit to eating them. Give it a try Pam! I agree with the above posters who say that seeds are for spitting, not eating. Not just spitting for distance, but also for aim. I get it that everybody here is an adult but I'd like to issue a gentle reminder that wasting food is a sin.